Two women’s lives collide when a priceless Russian artifact comes to light. Tanya Kagan, a rising specialist in Russian art at a top New York auction house, is trying to entice Russia’s wealthy oligarchs to bid on the biggest sale of her career, the Order of Saint Catherine, while making sense of the sudden and unexplained departure of her husband. 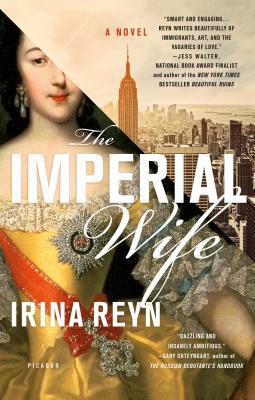 In Imperial Wife, as questions arise over the provenance of the Order and auction fever kicks in, Reyn takes us into the world of Catherine the Great, the infamous eighteenth-century empress who may have owned the priceless artifact, and who it turns out faced many of the same issues Tanya wrestles with in her own life. IRINA REYN is the author of What Happened to Anna K: A Novel. She teaches fiction writing at the University of Pittsburgh and has reviewed books for L.A. Times, Publishers Weekly, San Francisco Chronicle, Pittsburgh Post-Gazette, Hartford Courant, Minneapolis Star-Tribune, The Forward, and other publications. She was formerly the Books Editor for the online magazine, Killing the Buddha. "Reyn's mesmerizing new novel['s]...dual storylines are each intriguing, while the novel skips easily between past and present, leaving readers with more knowledge about Russia (imperial and present day), visual art, auction houses and the lives of the very rich. But its greatest accomplishment is making the inner lives of two fascinating women known... As a fast-paced novel, it's a great read, but as a meditation on what it means to be woman, it's transcendent." "Reyn cleverly weaves Tanya's story around that of young Catherine's [Catherine the Great]. Both suffer because they possess certain qualities—ambition, decisiveness, sangfroid—that society expects from powerful men but finds suspicious in women." "Two boss women living in very different time periods in history—modern-day New York City and 18th-century Russia—are connected through the ages by their shared obsession with a priceless piece of royal bling." "Irina Reyn's smart novel...seamlessly flits between the 20 years of Catherine, sometimes in a cold, friendless castle and Tanya, sometimes in a cold, loveless city. Both women are stronger and smarter than they realize and both are married to men who are anvils, not anchors."